Fresh breakfast with hot Belgian waffles, cappuccino and fruit. Fridges in all rooms. Free wifi in all rooms. Standard rooms accommodate 1-4 people, suites accommodate 1-6 and whirlpool suites accommodate 1-4 people. Built in a renovated grain elevator and barn, Little Swan Lake Winery and B&B is a unique, rustic get-away. Sip some wine, watch the buffalo roam and enjoy the beauty that is Little Swan Lake! This 16-acre camping area sits on 802-acre Iowa Lake and is state-owned, but county-managed. The lake lies with 308 acres in Iowa and 494 acres in Minnesota. This is the newest campground managed by the ECCB. It is a small primitive camping area with restored wetlands and native prairie area. Situated on 2,294-acre Tuttle Lake, 981 of these acres are in Iowa. 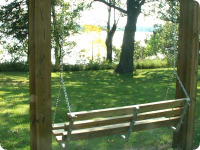 This 65-acre recreation area has been planned for camping, fishing, picnicking, and other recreation activities. It is located on the 467-acre High Lake. Part of the area is maintained as wilderness with trails developed throughout. Park office 8:00 a.m. - 4:00 p.m.